Whether you called him “Magic”, “Black Jesus”, or “the Pearl”, Vernon Earl Monroe was always going to take care of business on the basketball court. The shooting guard had a mesmerizing way of dribbling and moving up the court. It rarely seemed he dribbled in a straight line. He was always moving back and forth, forth and back, zig-zag and zag-zig. The constant, unpredictable motion created confusion in defenders who’d likely never seen a man dribble the way Earl did. After he’d get done putting you in the spin cycle, Monroe found it incredibly easy to raise up for his mighty fine jump shot. As a rookie with the Baltimore Bullets, the Pearl averaged a whopping 24 points. Winning Rookie of the Year, Monroe bolstered Baltimore’s win total from 20 victories in 1967 to 36 in 1968. Adding Wes Unseld to their core of Monroe and Gus Johnson, the Bullets improved to 57 wins in the 1969 season. That postseason Baltimore was upset by the New York Knicks in a 4-0 sweep. And thus began one of the great, if brief rivalries, in NBA history. In 1970, the two teams met again with the series going seven games. The Bullets ultimately lost, but the difference between a sweep one year, and a heart-breaking seven game grinder was Monroe. He had averaged 28 points in the 1969 series, but shot only 38% in the process. In 1970 he again hit 28 points but did it on 48% shooting. 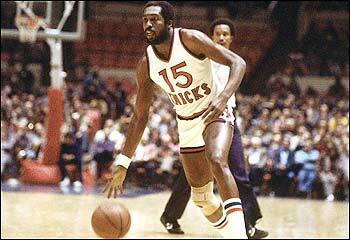 For a third straight time the Knicks and Bullets met in the postseason in 1971. With only 42 regular season wins, the Bullets were the underdogs, but shocked the Knicks with a 4-3 series win. The seventh game was decided by a score of 93 to 91 and Monroe led all players with 26 points. The win sent Baltimore to the Finals where they were overwhelmed by the mighty Milwaukee Bucks who had blazed through the regular season with 66 wins. Given the heated history of Baltimore and New York, it was a shock early in the 1971-72 season when the Bullets traded Monroe to the Knicks. After averaging 24 points in his years with the Bullets, Monroe slid into a bench role with the Knicks and averaged just 11 points that first season with them. And despite the fears, Monroe and his erstwhile on-court rival Walt Frazier got along just fine. Monroe in fact would go on to become the most dependable Knick of the mid-and-late 1970s after the club captured the title in 1973. Bill Bradley, Willis Reed, Jerry Lucas, Dave DeBusschere, and even Frazier, all eventually retired or were traded away. Young stars like Spencer Haywood and Bob McAdoo were brought in to resurrect the club, but through it all Black Jesus remained. After his first career act as Baltimore hot shot and his second career act as Knicks role player, Monroe emerged in 1975 as New York’s hot shot. From 1975 to 1978, the Pearl averaged 20 points while shooting 48.5% from the field and 82% from the line. He was better than ever it seemed. By 1978, though, it was clear that Monroe was relic of a bygone era. As brilliant as his individual play remained, there was nothing he could do in his mid-30s to save those Knicks whose other talent always seemed mismatched or coked out. 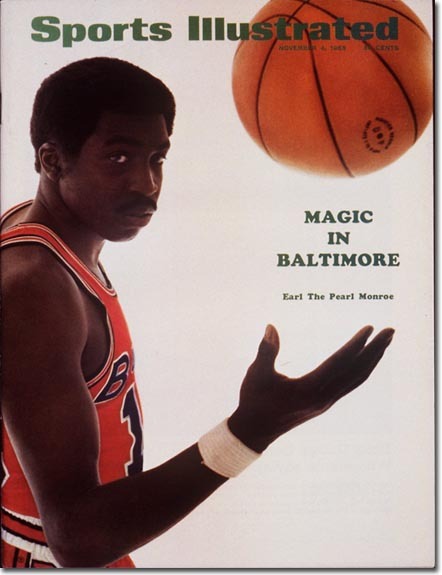 It’s been over 30 years since Earl Monroe retired, but the mere mention of his name… or of Magic, Black Jesus, the Pearl, or any of his other aliases… still conjures up images of a basketball wizard at work. A man whose game caused so much ruckus, and yet, somehow, walked softly in the night.